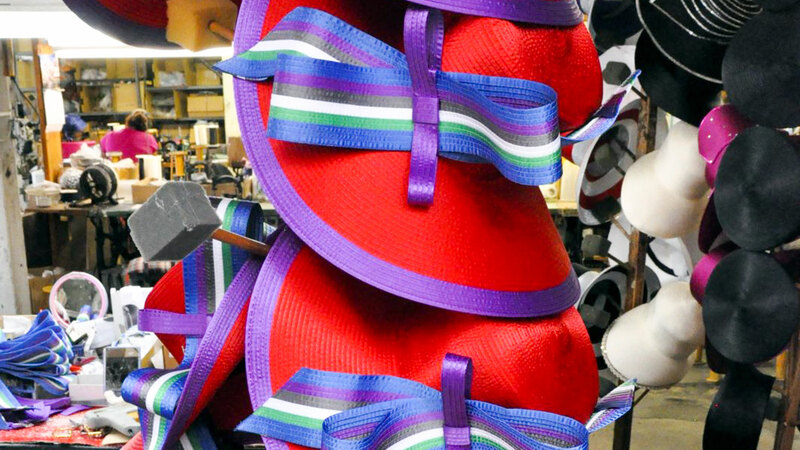 Fabric Selection, Cutting, and Sewing – Stage one begins with the design of the hat. Our designers often choose what material (straw, felt, satin ribbon etc.) we use in the manufacturing of our hats. Once we have the sample hat, which we call the blueprint, we then select the proper material. After the material is selected and cut to size our experienced men and women begin the creation of the actual hat body. This is done by using our specialized sewing machines. Our sewing machine table resembles that of an assembly line, with stations running the entire length of our factory sewing table. Each sewer, at each station, has full control over the pace and rate at which they use their machine. As the hat is manufactured by the sewer, it will begin to increase in size. After a few minutes of sewing, the hat becomes large enough to fit on a block. The block is used to manage and manipulate its size and shape to allow the sewer the ability to easily maneuver the hat as he/she continues to sew and complete the process. Blocking – For this stage we have the capabilities and options to use either our vintage wooden blocks or our aluminum metal blocks. 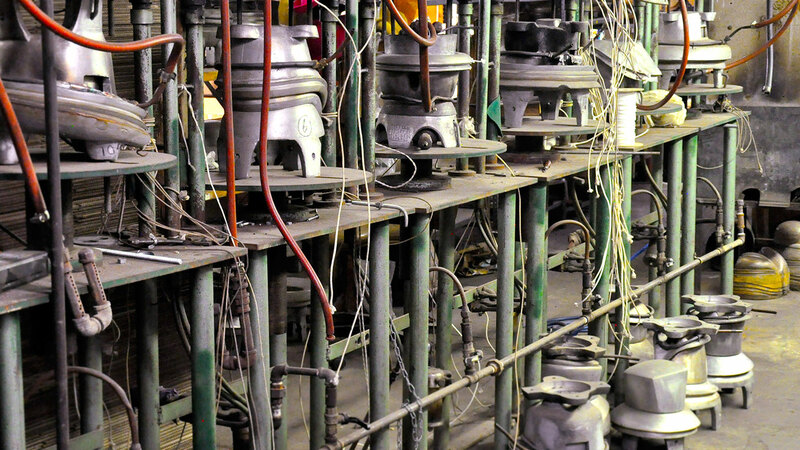 Many hat makers today use only aluminum blocks, which require that the hat be stretched over the block and then heated by gas or steam. This is the more modern and quicker way of accomplishing this step because it allows the blocker to not only shape the hat but the hat is actually dried out at the same time. However, our vintage hat blocks are historic and therefore very impressive. They can be used to create many different variations of the same style of hat by adding and subtracting or mixing and matching some blocks with others. Unfortunately, you cannot do this with aluminum blocks. Finishing – Once the hat is created by our sewers and blocked by our very talented blockers, it comes to the more cosmetic stage of the process. Finishing is the process of sewing in the hat lining and adding any additional decorations, such as bows, extra fabric, or rhinestones. At this stage a seemingly basic looking hat may become the talk of the town due to the cosmetic additions. This is truly the area where the designer’s vision plays out. Adding additional fabric to create bows or adding a rhinestone cluster is often the reason why our hats capture so much attention. 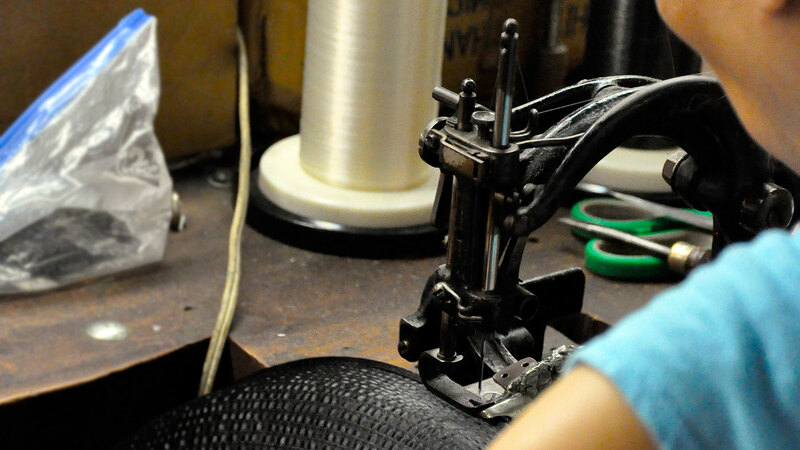 Trimming & Inspection – Our finishing station is really the first step to our quality control and inspection of the hat. Here, our hats are viewed as compared to the sample created by the designer and any and all excess or loose wiring, lining, or braid is cut and removed to complete the hat. Our hat is then transferred to a hat tree. 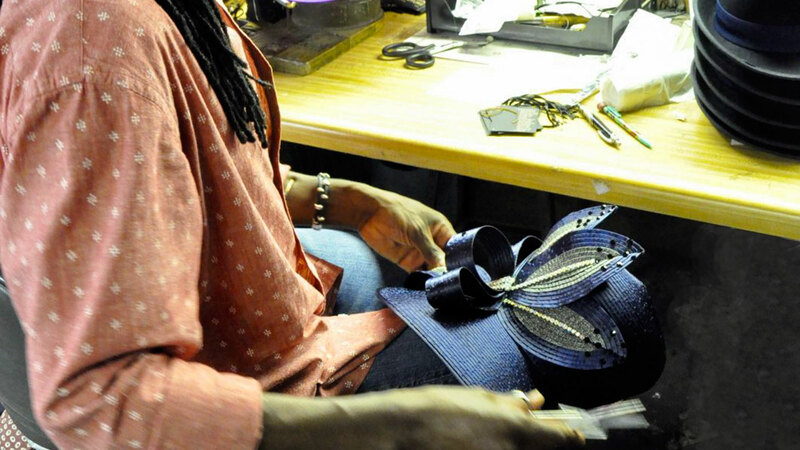 At this stage our hat is then inspected to ensure that the initial finishing stage was successful. If the hat conforms to the design sample it is then left on the tree to be shipped. If the hat does not mirror the sample design, it is removed from the tree and sent to its proper stage to either be repaired or re-trimmed.